Leave the glitz and glamour of Las Vegas behind for a day as you revel in the beauty of nature with the ultimate Grand Canyon experience. Along the way, stop by the Hoover Dam to marvel at this feat of engineering, choose to ride a horse via saddle or wagon or for an additional cost include a helicopter tour. Say see you later to the lights in the rear view as you head toward your first stop and an amazing photo opportunity at the overlook bridge of the Hoover Dam, built in memory of Mike O'Callaghan and Pat Tillman. Peer at the mighty Colorado over 800 feet (243 m) below. After you have soaked up the beauty of this engineering marvel, continue to the Grand Canyon. Upon arriving at the canyon, you saddle up for your hour-long horseback ride to the Buffalo Trail. Appreciate the scenic beauty and the variety of unique landscapes the desert has to offer from atop your horse. Then, if you elect to purchase the package with the Helicopter Tour, you can catch views from a traditional horse-drawn wagon as you roll through the desert. The wagon takes you directly to your next adventure, a breathtaking helicopter ride. Enjoy eagle-eye views of the majestically beautiful Grand Canyon as you fly over the rim. After you're back on the ground, head to Wild West Dining Hall to feast on a delicious meal while being entertained by dedicated cowboys. At the conclusion of your adventure, your driver escorts you back to your Las Vegas hotel. Live Commentary in English. Select this option for a tour that includes horseback riding. Live Commentary in English. Select this option for a tour that includes helicopter flight, horseback riding and a wagon ride. Car seats are required for children 5 and younger or weighing less than 60 pounds (27 kg). If you weigh 275 pounds (124.7 kg) or more you will be charged for an additional helicopter seat upon check in. An additional surcharge of $15 for ranch resort fees is payable on the day of your activity. Make sure, it's not a tour from Las Vegas, NV to Grand Canyon by Helicopter. It's a trip from Las Vegas to Grand Canyon by the van (duration 2,5 hours). 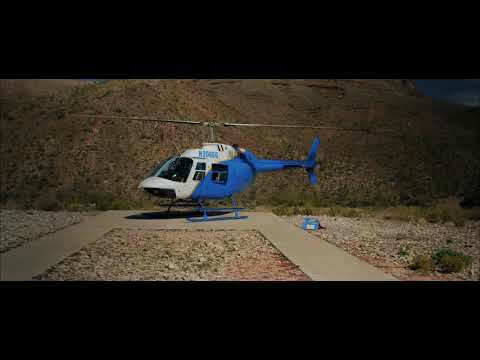 Helicopter trip 18 minutes from Rancho to Grand Canyon. Hors ride 45 minutes only. Also, if you come with your wife, girlfriend or husband, boyfriend... you will probably get separate sit in the helicopter for this romantic trip... yes, and driver, who will make a lot of jokes during your trip. I wanna say thank you only to the guy who played on the guitar at the ranch ! Kevin the driver was amazing, the flight amazing, wagon ride, food, singing, horse riding just pure finesse. Didn’t wanna leave and would have loved to stay the night. The wrangler Brett was out of this world and honeycomb my horse was a litttle diva (unlike me!).. just quality all round and Casey the singer was truly amaze balls. Loved the day and my heart was filled with joy, would love to revisit and cannot express how superb this ranch is and the staff within it.